B. Thomas (Arlington, Texas, United States) on 15 April 2012 in Landscape & Rural and Portfolio. 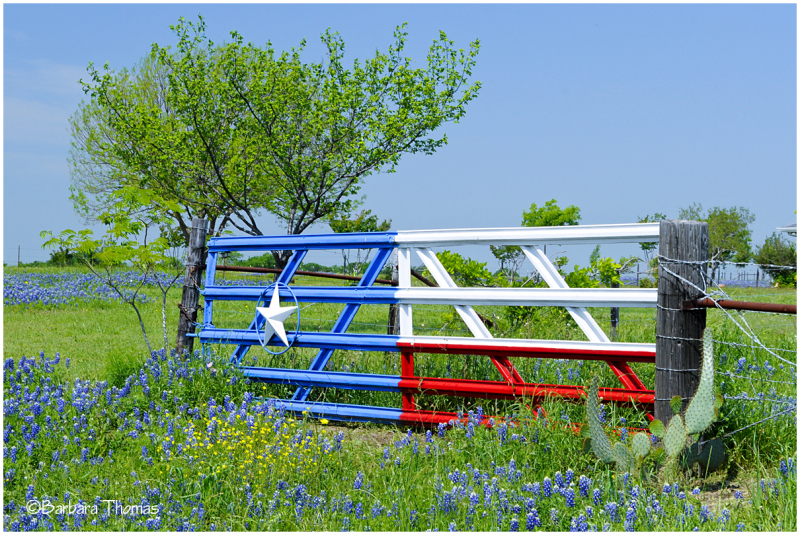 A gate surrounded by bluebonnets, painted to match the Texas red, white and blue flag with the star. A nice decoration. A like the surrounding flowers as well! Un petit air de France avec ces couleurs !!!!! I hope I am allowed to laugh . . oh, my . . this really is a keeper ! A great find and could be a postcard! You have to hand it some folks, they are ingenious! You're making Texas look pretty cool. Nice shot. Oh, my! What a patriotic shot for this Sunday. Oh, what a nice find!! And the bluebonnets match perfectly!! The colors red,white,blue are also the colors of holland. a patriotic cow gate, that's for sure !!! @Doug: I didn't know about the spotlight until I read your comment today. Thanks. Congratulations on the C. Spotlight Barbara !!!! A beautiful image. Congratulations on the Color Spotlight! I see you got a well-deserved Color Spotlight out of it so any laugh was on me, Barbara ! A real nice one for sure. @Ronnie 2¢: Ha, ha - who's laughing now. ;-) Thanks, Ronnie. @Eric Cousineau: Thank you, Eric. Congratulation on your color spotlight! @john4jack: Yes, someone from France mentioned that. Thanks, Jack. @Judy aka L@dybug: Several from France mentioned that they are similar. @Nigel: Thanks, Nigel. I just saw it today (Wednesday). @franz: At least for a day. LOL Thanks, Franz. Congratulations on colour spotlight !!! A well framed photo - great POV and of course stunning colours. Only in Texas. Great capture ! @Don: Ha! How true. ;-) Thanks. congrats on the spotlight! It is so well deserved!! Oh, wow, another Spotlight for you, B. Congratulations! You know how to show off the colors of Texas! you had luck for this picture, what a nice patriotic gate... congratulations on the spotlight, i got your blog trom there.. Such a beautiful image!!!! Simplicity!!!! Congratulations on color composition !! !